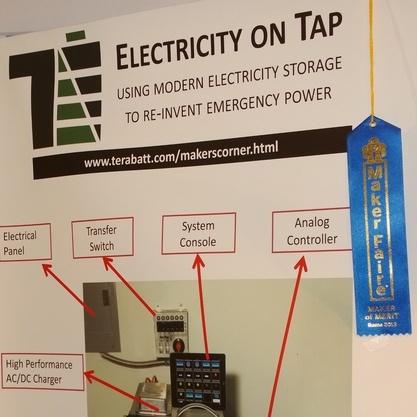 Terabatt’s MAKER initiative, Electricity on Tap, is a system that uses a smart electrical controller to take multiple power inputs and manage them in an optimal way for a given operating environment to constantly recharge electric-vehicle grade batteries. These inputs include solar, utility or standby generators, as well as electric vehicle (EV) components. This allows users to maintain power as batteries are charging and discharging with regularity, as if the electricity were simply "on tap." Terabatt’s offerings have been made possible by the path of reduced costs associated with EV technology, allowing us to explore more applications. The Electricity on Tap concept uses the battery as a main power source and the smart controller to charge the battery at maximum efficiency and minimal cost: it determines when and how to fast-charge Electrical Vehicle-grade batteries so that a significant amount of electricity is available for the desired use day in and day out. The Electricity on Tap system offers savings in fuel, noise, emissions, maintenance, and operating life, but unlike electric cars, the benefits go far beyond transportation. The system is fully configurable and has various operational modes that can accommodate a wide spectrum of potential users; from people in remote locations with sporadic access to power to utility companies with saturated urban grids to homes and businesses looking to use their generators to generate their own electricity more efficiently; urban to rural, overpopulated to the barely inhabited. The smart controller is built on Arduino’s open-source platform and, in the spirit of the open-source movement, we are inviting the community to work with us in refining the system and helping come up with new and innovative operational modes that will impact an even wider range of people worldwide. Regardless of the pace of adoption of hybrid technology and electrical vehicles (EV), a key fact often missed is that the commercial deployment of EVs has brought to market parts and sub-systems of great value whose price will be declining over time. The TeraBatt group of projects focuses on finding the most compelling cases for EV technology use outside transportation and using a community-based development and adoption approach to accelerate innovation that would otherwise be subject to the commercial inertia of the traditional marketplace. To facilitate the opportunity for almost anyone to reliably and consistently store and release significant amounts of electrical energy at a very rapid pace and frequency operating in a wide range of environmental conditions and locations. Though a seemingly straightforward statement, it has huge implications in terms of how the access to reliable energy differentiates the development options and quality of life for all of us. Access to such technology would redefine the understanding of efficient energy consumption in countless situations. This, ultimately, is what this project and TeraBatt as a whole stand for: turning idle emergency power infrastructure into active energy generation, storage and delivery to help provide reliable electrical power for persons and situations that need it but may not have consistent access to it. Regarding the current state of the emergency power industry, the TeraBatt system adds innovative software, cost savings associated with the open-source model, and standing ‘go-to-market’ alliances that leverage the reduced cost curve associated with proven components of hybrid and electric vehicles. 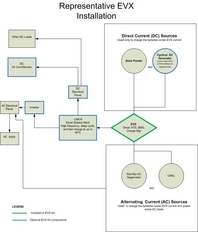 These components would convert IDLE EMERGENCY POWER (IDP) into an ACTIVE ENERGY STORAGE AND DELIVERY (AESD) setup. The AESD system provides energy availability, reliability, cost savings, and reduced emissions while leveraging grid, diesel, natural gas, and renewable sources. From the sales point of view, TeraBatt expects its solutions to be of great interest to the installed base of emergency generators, their existing sales and service channels, manufacturers of direct current air conditioners and generators, and natural gas distributors. The TeraBatt hybrid energy storage and delivery system, at the core of all the projects, makes use of a combination of factors to ensure the energy needed to power a load does not falter, all while minimizing the long-term economic and environmental cost. 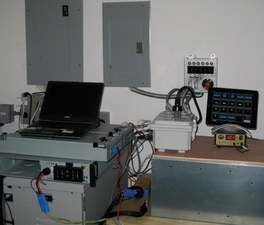 Multiple electrical power sources, special-purpose rechargeable batteries and chargers, optimized appliances and loads integrated with control software that maximizes a customer’s ability to use different power sources (utilities, emergency generator power, and battery power) all go into keeping a power load from faltering. This is done by automatically assessing when and how to generate, supply or recharge power rather than allowing continuous flow, much like what the Chevy Volt does today. TeraBatt's solutions are a combination of existing and new infrastructure, including diesel or natural gas generators, inverter or backup power system, high current charger, and TeraBatt's sophisticated control unit to enable the different operational modes. Furthermore, the modern battery sub-system is capable of operating at high temperatures, recharging/discharging quickly, and delivering thousands of charge/discharge cycles. The type and quantity of batteries required vary based on the amount of power needed, the location, and the operational mode. Using power from off-peak times to charge batteries and release during peak times. This mode optimizes for a specific run time and is made for those who are on a saturated grid and need more power, but cannot gain access to it. For unreliable grid service, charging batteries anytime power is available and always serving power loads exclusively from the batteries. 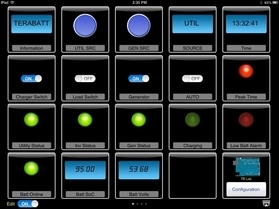 This mode uses any and all grid power available to charge the batteries rather than appliances to ensure uninterrupted power access even if the grid is spotty. Charging batteries at off-peak rates and release at peak rates. This option leans towards dollar savings rather than access to more power, particularly relevant for those situations when the peak and off-peak prices fluctuate drastically. For example, customers with extremely unreliable grid service but limited access to renewable sources can use the "GRID AS BACKUP" operational mode to deliver reliable electric service with their existing generator, but operating less than 60% of the time with major savings in fuel, emission, noise, and maintenance. Functionally, TeraBatt relies on a computerized system that controls the charging and battery sub-systems to ensure that diesel or natural gas power generators ONLY operate at peak efficiency during battery recharge, and manages the recharge process using the optimal source at a given time of the day. When the grid is used to recharge the batteries, the controller attempts to only recharge during off-peak rates. The system is aware of the historical consumption pattern and is able to adjust the time until the next recharge to optimize overall cost. The control unit demands minimal manual input – automatically turning particular switches or options on – and is designed to operate almost autonomously, removing the potential ownership barrier of long learning curves or having to spend significant amounts of time operating the system. The TeraBatt core system is controlled using a clean, well-organized interface, one of the system’s many open-source components. The interface can be downloaded as an app – at this point, only for the iPad, although it will expand to other devices in the near future. The interface allows the administrator to select the operational mode that best suits given needs, and to more quickly assess the current state of the system. Utility companies themselves could benefit from widespread usage of TeraBatt by providing supplemental power to saturated urban grids, providing utility service without building transmission and distribution lines, or having to generate less energy at peak times. Users in remote locations-- in situations as different as isolated mountain villages and luxury yachts in the open ocean -- would be able to generate more reliable energy and store it for longer, protecting them from outages. Data Centers that have reached their power limits could use supplemental power during server and storage consolidation efforts to lower overall power requirements. Local governments could respond more quickly to natural disasters, power their communities in a more efficient and environmentally conscious way, and lower their own operating costs. In addition, the system’s mostly open-source nature means the government would not have to purchase large amounts of costly intellectual property or pay heavy licensing/usage fees. Military outposts would need significantly less fuel to operate all the needed equipment. In the past, energy storage required massive investments that severely limited who could attempt to store energy (think water dams). By leveraging the drastic cost decreases in battery technology and using open-source programming for individual cases, TeraBatt greatly expands the demographic that has feasible access to consistent energy, and savings for those who do not use it effectively. Storing and releasing large amounts of energy once required exotic and unreliable elements, often verging on the dangerous. With new, simpler, safer technologies, there are many more ways to go about it, and, in our case, can be controlled by open-source hardware and software. Historically, even if you could store and release energy, doing it quickly meant that you could not do it often. The operating life of the components, as a result, would be severely diminished. Because of this the emergency power industry is full of “idle assets”, many of which could be converted to “active assets” that operate safely and reliably within reasonable environmental parameters. The implications here are TeraBatt’s most important and most effective; our programming allows energy to be consistently stored and used as best needed by making use of all of the infrastructure that has not yet been taken advantage of. Because of technological advances, the temperature and weight of mechanisms are now less significant than they ever were. That is, they are not something that must be regularly checked on by an individual, instead using our software and hardware to do the same devoid of people and change as needed to fit the given situation. Furthermore, in the majority of cases you can operate the energy storage solutions at room temperature and avoid needed energy just to keep the storage medium within its operating conditions. The cell site is a good example: more energy goes to keeping the emergency batteries cool than actually operating the site. The impact of this new reality, especially when mixed with community development and deployment and riding a curve of declining component pricing, is that intelligent general-purpose energy storage devices can be developed and deployed in a variety of use cases that would be governed by software specially written for that use case. Because of the technological and production advances on which TeraBatt was started, energy storage devices can be custom-made for urban, suburban, or rural settings; for agriculture or for the military; for the environmentally friendly or for the accidentally wasteful; for those who pay too much and use too little—any and all of these combinations work with the TeraBatt platform, and with its open-source programming, its specificity is limitless. As Chris Anderson explains in his book Makers, DIY manufacturing and open-source design have ended the monopoly of mass manufacturing, and TeraBatt, using those two movements, is here to ensure that the transformation of emergency power from idle-to-active is not left out, readily available and customizable for any situation that might need it. The system’s developers are taking advantage of many open-source technologies in the assembly of the TeraBatt solution, including the control interface, hardware sub-systems, and software libraries that provide processing power and device inter-operability. Doing so allowed TeraBatt to come together quickly and will allow it to adapt quickly once customer demand and industry and government regulations become clearer. 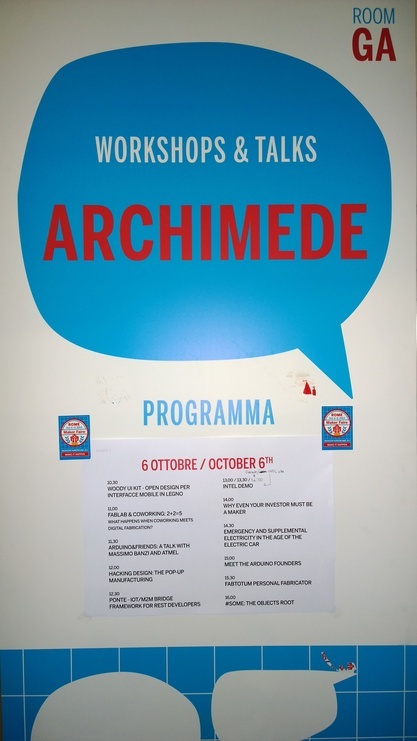 The developers also contributed some of their own unique coding and other intellectual work for use as open-source technology by others. At TeraBatt we believe that by promoting these solutions and other use cases identified by the community, a much larger ecosystem will emerge that will include electrical generator manufacturers, advanced battery makers, natural gas distribution companies, and renewable energy vendors. The community that emerges from this project can have a major impact in that development.